Q: I have a 23-year-old Morgan gelding. He gets agitated and skittish at the sight or sound of a hose, especially if it’s on. I would love to give him a bath, but I fear for his safety and mine. Any suggestions on how I might be able to give him a bath with a hose? A: You don’t mention if your horse has always suffered from hose phobia or if he’s developed it over time. But now you’re at the point of frustration. So let’s examine some of the reasons why a horse might get anxious at bath time. First, young horses are typically taught to stand still for a bath as part of their early education. Unfortunately, some horses never receive a proper foundation in groundwork. Consequently they learn they can walk all over their handlers in an effort to avoid a bath. Second, if a horse repeatedly endures rough treatment during a bath, they can become fearful of the process. That’s why the water temperature should never be icy cold. The water pressure should be appropriate, too, so the horse isn’t painfully blasted. 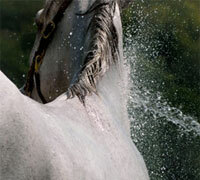 To keep water out the horse’s sensitive ears, it should never be sprayed directly into the horse’s face. Finally, some keen, sensitive horses remain suspicious of baths their entire lives. They snort at shampoo bubbles and dance around the water pooling at their feet. Though they may learn to stand for a bath (thanks to consistent groundwork) they’re never completely comfortable with the entire process. You can re-acquaint your equine senior citizen with the hose, but it’ll take time. Begin with a step-by-step process of integrating the hose into thorough grooming sessions. Treat it like just another grooming tool. 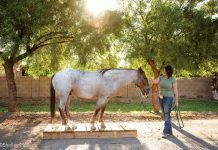 Keep the hose turned off and rub the end along your horse’s neck, chest and lower legs. These are the areas where he can keep an eye on the evil hose. Speak to him reassuringly, but be consistent in requiring him to respect your leadership. He can fidget, but he cannot become aggressive or attempt to flee the scene. That’s why you should avoid tying him up or snapping him in the crossties until he accepts a bath. A restrained horse that panics can injure himself and his handler. 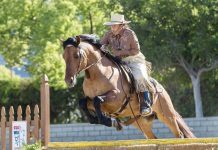 Instead, enlist the help of a knowledgeable horse person to hold your horse with a halter and lead rope during these early lessons. You and the handler can set parameters for your horse’s behavior, though never resort to smacking him or yelling. Focus on the positive and reward him with praise (and maybe a carrot) when he’s brave and a good boy. Eventually, turn the hose on to a mere dribble and repeat the process. Increase the intensity of the water and the length of the bath with each session. Though your horse may never become a bathing beauty, he should accept that a bath from the hose is not the horrendous horror he imagined. Thanks for the good suggestions. I’ll have to try it on my horse who also hates baths. I have a senior pony that paws the ground and does not stand still for a bath. She mostly just takes steps from side to side. thanks for the tips, but my horse still bolts when he sees the wash rack. My horse so freaks out with the hose blasting him that I’ve resorted to filling up a tub with water and using a bucket and sponge to apply it. He’s not afraid of hoses or sprinklers but panics if he gets water on him. I have worked with horses that are afraid of water and it is a real pain especially when you want to clean them before a show or cool them off on a hot day. You think they would enjoy it. I think the key is being firm, patient, and practicing daily. I’ll have to try some of this with my mare. She does a lot of dancing around. Start this when you are not hauling somewhere and have lots of time. Go outside, roll out as much hose as possible and have a long lead on the horse. Begin approach/retreat with the water on — spraying the feet first, then away, feet, then away. If the horse moves, follow with the hose until he stops. When he stops, shut off the spray. Horses learn just as much from when you stop your activity as when you start it. Keep doing this over and over, gradually moving to other parts of the body as he allows. Do this over several days, and you will be amazed at the results. The main problem is that people are in a hurry and want a quick fix. Take the time you need to address the problem when you aren’t in a hurry!